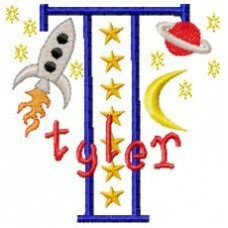 For your little Astronaut, I'm offering number 26 in a series of Monogram Name font sets, ROCKETSHIP! This CUTE set includes 26 upper case Monogram fonts that measure just about 4 inches in height, along with 26 lower case letters that measure approximately 1 1/4 inches in height PLUS various sizes of the adornments shown including a rocket ship, Moon and Stars, Planets and miscellaneous stars. These stitch quick and beautifully. Be sure to check out the Project Showcase to see how customers have used this SWEET set!